For the French clergyman and historian, see Paul Sabatier (theologian). Prof Paul Sabatier FRS(For) HFRSE (French: [sabatje]; 5 November 1854 – 14 August 1941) was a French chemist, born in Carcassonne. In 1912, Sabatier was awarded the Nobel Prize in Chemistry along with Victor Grignard. Sabatier was honoured for his work improving the hydrogenation of organic species in the presence of metals. Sabatier studied at the École Normale Supérieure, starting in 1874. Three years later, he graduated at the top of his class. In 1880, he was awarded a Doctor of Science degree from the College de France. In 1883 Sabatier succeeded Édouard Filhol at the Faculty of Science, and began a long collaboration with Jean-Baptiste Senderens, so close that it was impossible to distinguish the work of either man. They jointly published 34 notes in the Accounts of the Academy of Science, 11 memoirs in the Bulletin of the French Chemical Society and 2 joint memoirs to the Annals of Chemistry and Physics. The methanation reactions of COx were first discovered by Sabatier and Senderens in 1902. Sabatier and Senderen shared the Academy of Science's Jecker Prize in 1905 for their discovery of the Sabatier–Senderens Process. 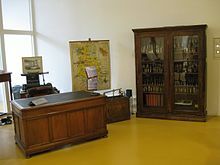 After 1905–06 Senderens and Sabatier published few joint works, perhaps due to the classic problem of recognition of the merit of contributions to joint work. Sabatier taught science classes most of his life before he became Dean of the Faculty of Science at the University of Toulouse in 1905. Sabatier's earliest research concerned the thermochemistry of sulfur and metallic sulfates, the subject for the thesis leading to his doctorate. In Toulouse, he continued his physical and chemical investigations to sulfides, chlorides, chromates and copper compounds. He also studied the oxides of nitrogen and nitrosodisulfonic acid and its salts and carried out fundamental research on partition coefficients and absorption spectra. Sabatier greatly facilitated the industrial use of hydrogenation. In 1897, building on the recent biochemical work of the American chemist, James Boyce, he discovered that the introduction of a trace amount of nickel (as a catalyst) facilitated the addition of hydrogen to molecules of most carbon compounds. The reduction of carbone dioxide using hydrogen at high temperature and pressure is another use of nickel catalyst to produce methane. This is called the Sabatier reaction and is used in the International Space Station to produce the necessary water without relying on stock from the earth. Sabatier was married with four daughters, one of whom wed the famous Italian chemist Emilio Pomilio. ^ Rideal, E. K. (1942). "Paul Sabatier. 1859-1941". Obituary Notices of Fellows of the Royal Society. 4 (11): 63–66. doi:10.1098/rsbm.1942.0006. ^ a b c d "Paul Sabatier - Biography". The Nobel Foundation. Retrieved 2013-12-07. ^ a b c Alcouffe 2006, p. 10. ^ Rönsch et al. 2016. ^ Administrator, NASA Content (2015-08-17). "The Sabatier System: Producing Water on the Space Station". NASA. Retrieved 2018-09-06. "Paul Sabatier (to 150th anniversary of his birthday)". Russian Journal of Applied Chemistry. 77 (11): 1909–1912. 2004. doi:10.1007/s11167-005-0190-6. Rideal, E. K. (1951). "Presidential address. Concepts in catalysis. The contributions of Paul Sabatier and of Max Bodenstein". Journal of the Chemical Society (Resumed): 1640–1647. doi:10.1039/JR9510001640. Taylor, H. (1944). "Paul Sabatier 1854–1941". Journal of the American Chemical Society. 66 (10): 1615–1617. doi:10.1021/ja01238a600. This page was last edited on 15 March 2019, at 22:59 (UTC).